What is My Child Learning, and How Can I Help? What is Reteach and Enrich? Parents, these are the standards taught by Beyond Textbooks partner schools. This list is in alphanumeric order, and your school will likely teach them in a different order. For help deciphering the code in front of the standard, please click here. 9.RST.04: I can determine what symbols, key terms, words, and phrases mean after reading a text. HS.1S.C1.PO3: I can formulate a testable hypothesis. HS.1S.C2.PO3: I can design a written plan of action for testing a hypothesis. HS.1S.C2.PO4: I can perform a planned experiment. HS.1S.C3.PO2: I can determine if data supports a hypothesis. HS.1S.C3.PO6: I can analyze data using statistics. HS.1S.C4.PO2: I can produce graphs to communicate data. HS.1S.C4.PO4: I can support my conclusion with scientific arguments. HS.4M.C4.PO1: I can use dimensional analysis to keep track of units of measure when converting. 9.RST.01: I can read a science text and cite evidence to make a conclusion. 9.RST.07: I can translate information between mathematical, written, and graphic forms. HS.5S.C2.PO1: I can describe how things change over time. HS.5S.C2.PO14: I can discover the Law of Conservation of Momentum. HS.5S.C2.PO2A: I can analyze how position and velocity relate. HS.5S.C2.PO2B: I can analyze how acceleration and time relate. HS.5S.C2.PO3: I can discover Newtons 1st Law of Motion. HS.5S.C2.PO4: I can use Newtons 2nd Law of Motion to describe forces. HS.5S.C2.PO5: I can discover the law of action and reaction. HS.5S.C2.PO6: I can use vectors to describe two dimensional motion. 9.RST.08: I can evaluate the author’s claim based on the data presented in the text. HS.5S.C3.PO1: I can describe how energy is stored in a system in various ways. HS.5S.C3.PO3: I can discover the law of conservation of energy. HS.5S.C5.PO1: I can explore how energy and matter interact. HS.5S.C5.PO2: I can describe the characteristics of waves. HS.5S.C1.PO6: I can describe what are chemical bonds. HS.5S.C3.PO6: I can distinguish between heat and temperature. HS.5S.C5.PO4: I can describe kinetic theory. HS.5S.C5.PO9: I can quantify how electricity does work. HS.2S.C1.PO2: I can describe how diverse people contributed to science. HS.2S.C2.PO2: I can explain how scientific knowledge evolves. HS.2S.C2.PO4: I can describe how scientists continue to advance scientific knowledge. 10.RST.01: I can cite textual evidence to support what the text says and what conclusions are being made. HS.4S.C1.PO2: I can compare the form and function of prokaryotic and eukaryotic cells and their cellular parts. HS.4S.C1.PO4: I can analyze mechanisms of transport of materials into and out of cells. HS.4S.C5.PO1: I can compare the processes of photosynthesis and cellular respiration in terms of energy flow, reactants, and products. HS.4S.C5.PO2: I can describe the role of organic and inorganic chemicals important to living things. HS.4S.C1.PO5: I can describe the purposes and processes of cellular reproduction. HS.4S.C2.PO2: I can describe the molecular basis of heredity, in viruses and living things, including DNA replication and protein synthesis. HS.4S.C2.PO3: I can explain how genotypic differences occur and results in phenotypic variety. HS.4S.C2.PO4: I can describe how meiosis and fertilization maintain genetic differences. HS.4S.C4.PO2: I can explain how genotypic and phenotypic differences can result in changes that may help or hurt an organism's success in an environment. 10.RST.05: I can analyze relationships among concepts in a text including relationships among key terms. HS.4S.C3.PO1: I can identify the relationships among organisms within populations, communities, ecosystems, and biomes. HS.3S.C3.PO2: I can describe biotic and abiotic factors that affect human populations. HS.4S.C3.PO3: I can assess how the size and the rate of growth of a population are determined by birth rate, death rate, immigration, emigration, and carrying capacity of the environment. HS.4S.C4.PO1: I can identify the components of natural selection which can lead to speciation. HS.4S.C4.PO3: I can describe how the continuing operation of natural selection triggers a population's ability to adapt to changes in the environment and leads to biodiversity and the origin of new species. HS.4S.C4.PO4: I can predict how a change in an environmental factor can affect the number and diversity of species in an ecosystem. HS.4S.C4.PO6: I can analyze, using a biological classification system, the degree of relatedness among various species. HS.4S.C5.PO4: I can diagram the energy flow in an ecosystem through a food chain. HS.4S.C5.PO5: I can describe the levels of organization of living things from cells, through tissues, organs, organ systems, organism, populations, and communities to ecosystems. 10.RST.09: I can compare and contrast the results of different scientists experiments (and to my own using peer review). HS.3S.C2.PO3: I can support a position on a science or technology issue. 10.RST.10: I can read and comprehend science/technical texts in Biology and Physics independently and proficiently. HS.1S.C1.PO1: I can evaluate whether the scientific information is relevant to a given problem. HS.1S.C1.PO2: I can develop questions from my observations that transition to testable hypotheses. HS.1S.C1.PO4: I can predict the outcome of an investigation based on prior evidence, probability, and/or modeling. HS.1S.C2.PO1: I can demonstrate safe and ethical procedures (e.g., use and care of technology, materials, organisms) and behavior in all science inquiries. HS.1S.C2.PO2: I can identify the resources needed to conduct an investigation. HS.1S.C2.PO3: I can design an appropriate protocol for testing a hypothesis. HS.1S.C3.PO1: I can interpret data that show a variety of possible relationships between variables. HS.1S.C3.PO2: I can evaluate whether investigational data support or do not support the proposed hypothesis. HS.1S.C3.PO4: I can evaluate the design of an investigation to identify possible sources of procedural error. HS.1S.C3.PO5: Design models (conceptual or physical) of the following to represent "real world" scenarios: collisions, carbon cycle, water cycle, and phase change. HS.1S.C3.PO7: Propose further investigations based on the findings of a conducted investigation. HS.1S.C4.PO1: For a specific investigation, I can choose an appropriate method for communicating the results. HS.1S.C4.PO3: Communicate results clearly and logically. HS.1S.C4.PO4: I can support conclusions with logical scientific arguments. HS.2S.C1.PO1 (Teacher Assessed): I can describe how human curiosity and needs have influenced science, impacting the quality of life worldwide. HS.2S.C1.PO2 (Teacher Assessed): I can describe how diverse people and/or cultures, past and present, have made important contributions to scientific innovations. HS.2S.C1.PO3: I can analyze how specific changes in science have affected society. HS.2S.C1.PO4 (Teacher Assessed): I can analyze how specific cultural and/or societal issues promote or hinder scientific advancements. HS.2S.C2.PO1: I can specify the requirements of a valid, scientific explanation. HS.2S.C2.PO2: I can explain the process by which accepted ideas are challenged or extended by scientific discoveries. HS.2S.C2.PO4 (Teacher Assessed): I can describe how scientists continue to investigate and critically analyze aspects of theories. HS.3S.C2.PO2 (Teacher Assessed): I can recognize the importance of basing arguments on a complete understanding of the core concepts and principles of science and technology. HS.3S.C2.PO4: Analyze the use of renewable and nonrenewable resources in Arizona: water, land, soil, minerals, and air. HS.3S.C3.PO1: Analyze social factors that limit the growth of a human population, including: affluence, education, access to health care, and cultural influences. 11.RST.04: I can determine the meanings of symbols, key terms, and domain-specific words; and analyze how they are used in specific scientific and technical contexts. HS.PS1.a (atomic structure): I can use models to explain how atoms and molecules are structured, and how they behave. The development of atomic and molecular models is a work in progress. HS.PS1.a (electron organization): I can use models to explain how atoms and molecules are structured, and how they behave. The development of atomic and molecular models is a work in progress. HS.PS1.a (matter & properties): I can use models to explain how atoms and molecules are structured, and how they behave. The development of atomic and molecular models is a work in progress. HS.PS1.b (periodic tables): I can predict the outermost arrangement of electrons for a given element based on where it is on the periodic table and use this information to predict other elements it may bond with. I can show how electrons are involved in bonding. I can predict the properties of elements based on their location on the periodic table. HS.PS4.e: I can explain how light can be represented by either a wave or a particle, and which is better under specific circumstances. I can relate the movement of electrons within an atom to the transmission of light. I can relate the wavelength of electromagnetic radiation to energy. 11.RST.03: I can analyze and explain complex ideas, results, and sequence of events that are developed over the course of a complex multistep procedure. 11.RST.07: I can integrate and evaluate multiple sources of information from diverse formats in order to address a question or solve a problem. 11.RST.08: I can evaluate validity of the hypothesis, data, analysis, and conclusions in a science or technical text. I can verify corroborating or challenging conclusions with other sources of information. HS.PS1.a: I can use models to explain how atoms and molecules are structured, and how they behave. The development of atomic and molecular models is a work in progress. HS.PS1.b (covalent bonding): I can predict the outermost arrangement of electrons for a given element based on where it is on the periodic table and use this information to predict other elements it may bond with. I can show how electrons are involved in bonding. I can predict the properties of elements based on their location on the periodic table. HS.PS1.b (ionic bonding): I can predict the outermost arrangement of electrons for a given element based on where it is on the periodic table and use this information to predict other elements it may bond with. I can show how electrons are involved in bonding. I can predict the properties of elements based on their location on the periodic table. HS.PS1.h (molar mass): I can write a balanced chemical equation. I can describe the mole concept and its relationship to Avogadros number. I cannot destroy atoms; therefore I cannot destroy matter, in a chemical reaction. I can show proof for this statement using math and the periodic table. I can calculate the amount of products produced by a chemical reaction given the amount of reactants, or vice versa. HS.PS1.h (the mole concept): I can write a balanced chemical equation. I can describe the mole concept and its relationship to Avogadros number. I cannot destroy atoms; therefore I cannot destroy matter, in a chemical reaction. I can show proof for this statement using math and the periodic table. I can calculate the amount of products produced by a chemical reaction given the amount of reactants, or vice versa. HS.PS1.i: I can predict the outcome of various simple chemical reactions and balance the finished equations to demonstrate conservation of matter. I can classify chemical reactions by reaction type. HS.PS1.h (balancing equations): I can write a balanced chemical equation. I can describe the mole concept and its relationship to Avogadros number. I cannot destroy atoms; therefore I cannot destroy matter, in a chemical reaction. I can show proof for this statement using math and the periodic table. I can calculate the amount of products produced by a chemical reaction given the amount of reactants, or vice versa. HS.PS1.c (gas laws): I can predict and infer the strength of bonds and the interaction of atoms and molecules based on the observable properties of a substance. HS.PS1.c (states of matter & kinetics): I can predict and infer the strength of bonds and the interaction of atoms and molecules based on the observable properties of a substance. HS.PS1.h (stoichiometry): I can write a balanced chemical equation. I can describe the mole concept and its relationship to Avogadros number. I cannot destroy atoms; therefore I cannot destroy matter, in a chemical reaction. I can show proof for this statement using math and the periodic table. I can calculate the amount of products produced by a chemical reaction given the amount of reactants, or vice versa. HS.PS1.d: I can show that energy input is required to break chemical bonds I can show that energy is released when chemical bonds are formed. HS.1S.C1.PO1: I can evaluate scientific information for relevance to a given problem. HS.1S.C1.PO2: I can develop questions from observations that transition into testable hypotheses. HS.1S.C2.PO1: I can demonstrate safe and ethical procedures and behavior in all science inquiries. HS.1S.C2.PO4: I can conduct a scientific investigation that is based on a research design. HS.1S.C2.PO5: I can record observations, notes, sketches, questions, and ideas using tools such as journals, charts, graphs, and computers. HS.6S.C3.PO1: I can describe the scientific theory of the origin of the solar system. HS.6S.C3.PO2: I can describe the characteristics, location, and motions of the various kinds of objects in our solar system. HS.6S.C3.PO3: I can explain the phases of the moon, eclipsis, and the interaction of the sun, moon and earth. HS.6S.C4.PO1: I can describe the Big Bang Theory as an explanation for the origin of the universe. HS.6S.C4.PO2: I can describe the fusion process that takes place in stars. HS.6S.C4.PO3: I can analyze the evolution of various types of stars using the Hertzprung-Russell (HR) diagram. HS.6S.C4.PO4: I can compare the evolution of stars of different masses. HS.6S.C4.PO5: I can explain the formation of the light elements in stars and the heavier elements in supernova explosions. HS.6S.C4.PO6: I can explain the evolution and life cycles of galaxies. HS.2S.C1.PO1: I can describe how human curiosity and needs have influenced science, impacting the quality of life worldwide. HS.3S.C2.PO1: I can analyze the costs, benefits, and risks of various ways of dealing with needs or problems. HS.3S.C2.PO4: I can analyze the use of renewable and nonrenewable resources in Arizona. HS.6S.C1.PO1: I can identify ways materials are cycled within the earth system. HS.6S.C1.PO3: I can explain how the rock cycle is related to plate tectonics. HS.6S.C1.PO4: I can demonstrate how the hydrosphere links the biosphere and lithosphere. HS.6S.C1.PO6: I can analyze methods of reclamation and conservation of water. HS.6S.C1.PO7: I can explain how the geochemical processes are responsible for the concentration of economically valuable minerals and ores in Arizona and worldwide. HS.6S.C2.PO1: I can describe the flow of energy to and from the Earth. HS.6S.C2.PO2: I can explain the mechanisms of heat transfer land masses. HS.6S.C2.PO7: I can analyze the seismic evidence used to determine the structure of the Earth. HS.6S.C2.PO8: I can describe how radioactive decay maintains the Earth's internal temperature. HS.6S.C3.PO4: I can interpret a geologic time scale. HS.6S.C3.PO5: I can distinguish between relative and absolute geologic dating techniques. HS.6S.C3.PO6: I can investigate scientific theories of how life originated on Earth. HS.6S.C3.PO7: I can describe how life on Earth has influenced the evolution of the Earth's systems. HS.6S.C3.PO8: I can sequence major events in the Earth's evolution using relative and absolute dating data. HS.6S.C3.PO9: I can analyze patterns in the fossil record related to the theory of organic evolution. HS.6S.C1.PO2: I can demonstrate how dynamic processes such as weathering, erosion, sedimentation, metamorphism, and orogenesis relate to redistribution of materials within the earth system. HS.6S.C1.PO5: I can describe factors that impact current and future water quantity and quality including surface, ground, and local water issues. HS.6S.C2.PO4: I can demonstrate the relationship between the Earth's internal convective heat flow and plate tectonics. HS.6S.C2.PO5: I can demonstrate the relationships among earthquakes, volcanoes, mountain ranges, mid-oceanic ridges, deep sea trenches, and tectonic plates. HS.6S.C2.PO6: I can distinguish among seismic S, P, and surface waves. HS.6S.C2.PO10: I can demonstrate the effect of the Earth's rotation on the movement of water and air. HS.6S.C2.PO11: I can describe the origin, life cycle, and behavior of weather systems. HS.6S.C2.PO12: I can describe the conditions that cause severe weather. HS.6S.C2.PO13: I can propose appropriate safety measures that can be taken in preparation for severe weather. HS.6S.C2.PO14: I can analyze how weather is influenced by both natural and artificial earth features. HS.6S.C2.PO15: I can list the factors that determine climate. HS.6S.C2.PO16: I can explain the causes and/or effects of climate changes over long periods of time. HS.6S.C2.PO17: I can investigate the effects of acid rain, smoke, volcanic dust, urban development, and greenhouse gases, on climate change over various periods of time. HS.6S.C2.PO3: I can distinguish between weather and climate. HS.6S.C2.PO9: I can explain the effect of heat transfer on climate and weather. Parents, these sites are free to use, or have at least some free options. Some may require creating a free account. Once you know the name of the standard your child is working on, try searching within the site for that standard. ReadWorks - thousands of free reading passages. You can sort by grade, topic, difficulty and more. Create a free account in the upper right corner. Mood and Tone: a list of words to use when describing mood and tone - descriptive words to pump up the quality of writing. Biology Corner - a very detailed source for Biology resources. Mostly high school level, but useful in middle school as well. Khan Academy - instructional videos on many standards. Search by subject and standard. History.com - a great source for Social Studies resources, documents, and video clips. Teachers Pay Teachers - many of these resources require purchase, but some are free to download and use. The Science Spot - many resources based on science. Searchable by topic and subject. Text structures: types, outlines, and examples - very useful guidelines on writing and types of writing. Purple Math - informative explanations of many math topics. Searchable by content and standard. 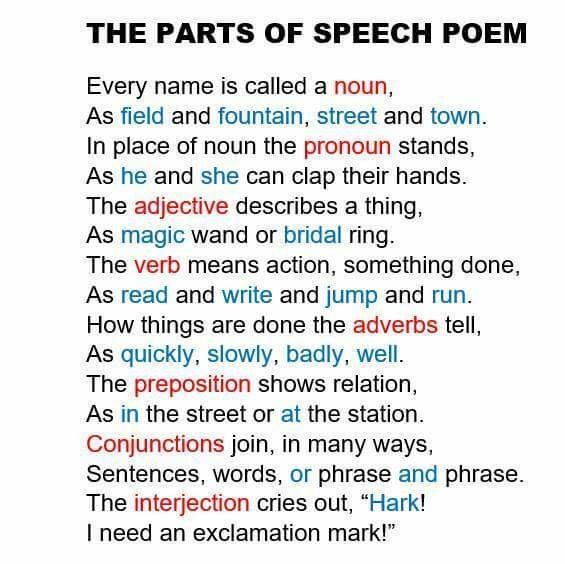 Parts of Speech - a good ELA resource based on parts of speech. YouTube - try searching for a specific topic, such as "how to add fractions". NewsELA - student-friendly articles based on news and current events. LearnZillion - many resources for students and parents in grades 3-9, ELA and Math. Common Lit - many reading resources based on all content areas. Searchable by topic and subject. ReadWriteThink - a very powerful website for ELA standards and practice. Math Antics - a YouTube channel with great math how-to videos. Educator.com - many of these resources require a paid subscription, but some are free to view. Good section on AP classes. Big History Project - a comprehensive "history of the universe" project.